are strong in the broken places. When life seems overwhelming… there is help and hope. Sometimes we feel that life is unmanageable or that we’re burned out. We all experience difficulties or losses which seem overwhelming. And most of us at one time or another experience marriage, family or relational problems. As a licensed, clinical, professional counseling practice, we offer help. We work together with you to identify problems, find the resources which will make your life more manageable, and facilitate the healing process. In offering clinical assistance, we’re committed to a practice that explores the needs that you find the most pressing. You come to a better understanding of your thoughts and feelings through a caring counseling relationship using helpful dialogue, consultation and other resources. You learn skills to help you cope with your problems more effectively and plan realistic goals. So, when life becomes overwhelming… you can find help and hope through counseling for your anger and other issues. Or you may want to explore the Anger Management Coaching services we offer. You may need to obtain an Anger Management Evaluation/assessment. Anger Management Assessments/Evaluations are sometimes ordered by courts, employers or institutions. We are providers of official anger management evaluations and recommendations. CounselCare Connection and the Anger Management Institute are located at 1200 Harger Rd., Suite 602, Oak Brook, IL 60523. For information on office and phone sessions call Lynette at: 630-368-1880, ext. 1.
has been recognized as a National Certified Counselor (NCC) through the(NBCC) National Board for Certified Counselors, Inc and is a Licensed Clinical Professional Counselor in the State of Illinois. Lynette is a Board Certified Professional Christian Counselor and a Charter Member of the American Association of Christian Counselors. Lynette is the President of the Anger Management Institute and CounselCare Connection, P.C., a Critical Incident Stress Management provider, and a crisis counselor with the Crisis Care Network providing counseling and debriefing to various companies. Mrs. Hoy is an Anger Management Specialist-V, Supervisor, Consultant and Diplomate with the National Anger Management Association. The Anger Management Institute Trainer certification programs have been approved and endorsed by NAMA. 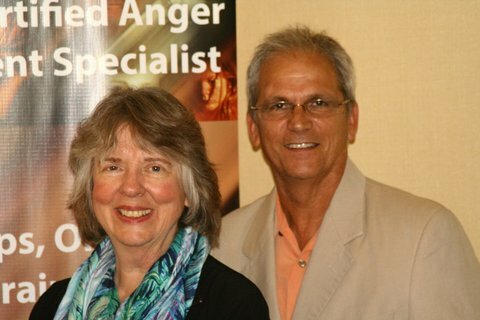 Lynette has trained 100’s of individuals and couples in anger and conflict management. Lynette co-authored all three editions of the book What’s Good About Anger?, and provides anger management seminars, classes, training courses and certificate programs. Read about speaking engagements, radio interviews. Mrs. Hoy is a member in good standing with AACC and had been the Director of LifeCARE for over 9 years, a ministry offering lay helping programs at Calvary Memorial Church in Oak Park, IL. 630-368-1880 or contact Lynette Hoy directly at: 708.341.5438. See CounselCare Connection for more information on office, phone sessions and email counseling and resources. Is an Anger Management Specialist, Diplomate, Supervisor and Consultant with NAMA & the Anger Management Institute. Mr. Yeschek was recently designated an Anger Management Specialist-1V by the National Anger Management Association granting him the authority to certify Anger Management Specialists through NAMA. Steve brings years of expertise and experience in training, coaching and counseling clients and groups in anger, addictions, mood and behavioral disorders and relationships issues.Steve has been the Director of the Chicagoland Rapha Treatment Centers and is an ordained Pastor with the Evangelical Free Church. Steve is co-founder and Vice-President of CounselCare Connection, P.C. and co-presenter of the anger management Trainer-Specialist certification workshops. He has been trained in coaching and now trains others in coaching skills. Steve holds membership with the NASW, CAPS and AACC professional counseling organizations. Steve has presented various seminars and classes on crisis counseling & referral, substance abuse, self-worth, shame, codependency, marriage, family, personal growth and relationship topics to Rapha, Sunday School Associations, Cook County Employee Assistance Program, Channel 38 counselors, substance abuse agencies and various other groups and organizations over the years. Steve practices out of the CounselCare Connection, P.C.-Anger Management Institute office location at: 1200 Harger Rd., Suite 602, Oak Brook, IL and Yeschek and Associates Counseling Center, 2615 Three Oaks Rd., Cary, IL. Contact Steve Yeschek directly at: 708-732-3527.